Sorry for denying you my latest playlist wizardry last week. You may have a hole in your heart, but I now have four in my mouth. It hurts just typing that. 1. I think it might be better for my oral surgeon to learn the concept of "underpromising and overdelivering". 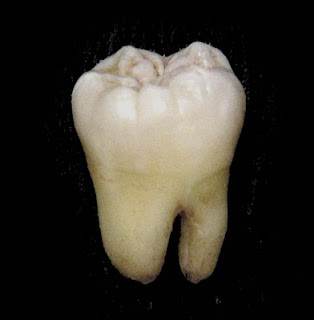 This wisdom tooth--or should I say teeth (all four)--extraction was not the cake walk I was led to believe it would be. 2. Pain builds character. And while it's building that character in an excruciating way, all the other stupid pain you thought was really important--over money, personal life, your disappointing sports team, etc.--suddenly isn't so important. A nice bout of physical pain helps you realize that all those other things can't be that big of a deal if your mind can be so easily re-directed from them. After this week, I am less frustrated, less longing, less dissatisfied, less lonely, less heavy, less pretty much everything. A week ago, victory might have meant finding the love of my life, or having a family, or somehow becoming a fully realized man. Now victory would just be the ability to eat some chips and salsa. Perspective. 3. When you talk for a living like a do, a two hour presentation when your jaw is in searing pain is a true test of will. As well as a test of one's ability to explain away tears to a group of fifteen people you've just met. 4. And on the third day, God created hydrocodone. And He saw that it was good. 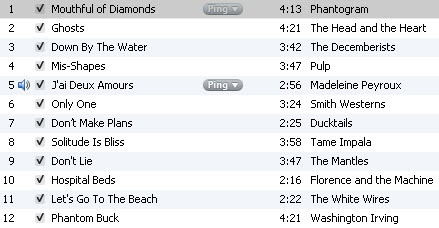 So here's your much delayed playlist, my faithful followers. I'll try to do another at the end of the week to make up for last week. Another airport commuter list for the dark and handsome gentleman who is back on the road again. Or for me. Whatever. Anyway, after the highly popular "Slow Jamz" playlist of last week, I thought it would probably be wise to mix in some tunes this week that don't explicitly involve the concept of "freakin' you all night long"--you know, just as a change of pace. All of this is either new music or music that's new to me. Many thanks to those of you who have made some strong to quite strong recommendations of late. Your input is appreciated when it is. And I mean that. So say a prayer/think a good thought for me as I head right back to cold, snowy, dirty Pennsylvania this week. I'll be thinking of you. Well, not you. But you? DEFINITELY. Random, but potentially important note regarding this playlist: I think The Head and the Heart may just be the next big thing. In a good way. Having my wisdom teeth out was the worst pain possible, so sorry you had to go through that! Nice mix Roberto! Glad you are feeling better.